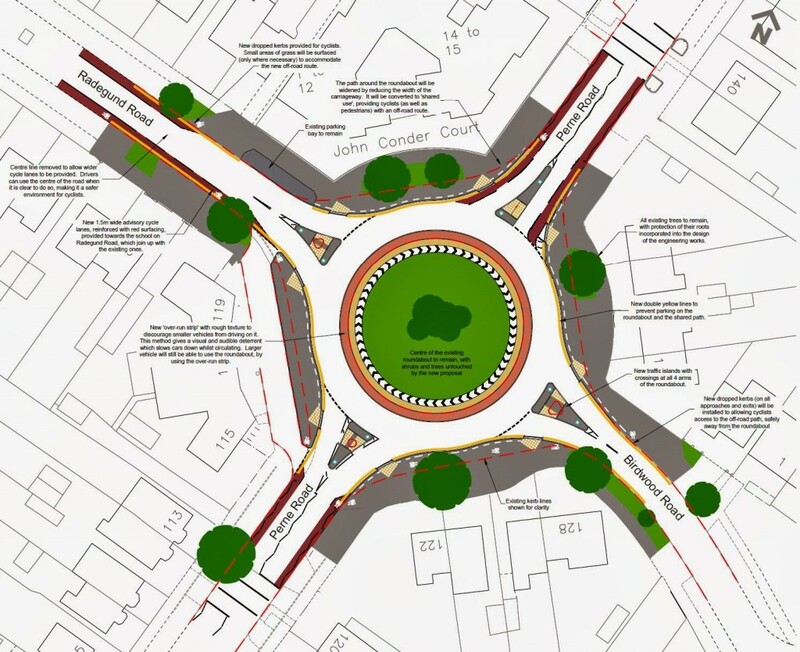 Perne Road roundabout has recently been altered to tighten its geometry. This idea of tightening roundabout geometry has been around for a couple of decades, featuring in a DfT traffic advisory leaflet as early as 1997. The idea was particularly promoted by the Swiss, who have a very “on-road” tradition of providing for cycling. See Resources for more info. This diagram shows what has been done at Perne Road (on the three arms to the left and bottom), and what I suggest would be closer to Swiss practice on the top right. The red dashes show the kerb line before the alterations. The key feature of the Swiss design (and indeed of Dutch designs) is that the approach is perpendicular to the roundabout. This means that at the point where the driver is giving way, their wheels are straight. This substantially reduces entry speed. The Swiss stop the cycle lane before the roundabout, to indicate that road users really ought to enter the roundabout in single file. But in practice, cyclists remain alongside the kerb. So in Oxford we continue the cycle lane up to the give way line. This does not seem to cause any problems, nor have any impact on cyclists’ positioning on the roundabout itself. Even though there’s a cycle lane, I have narrowed the entry down to 4 metres, in accordance with Swiss designs. This should discourage undertaking of large vehicles, and overtaking by large vehicles. I have marked the cycle lane straight, with an overrun area on the corner, based on a design used in Münster in Germany. The overrun area is textured to discourage use by cyclists. Cyclists need to approach the roundabout perpendicularly and give way, and not leave room for drivers to enter the roundabout in parallel with them. I’ve drawn it tighter than the Münster design (maybe too tight). I have moved the outside kerb line by about a metre. This imposes the Dutch 12m radius, but drawn from the edge of the traffic lane, rather than the edge of the road. This would have to be tracked to ensure that large vehicles can get round, but it should be approximately correct. The rear wheels of large vehicles overrun the cycle lane, obviously. Following the Swiss, the exit has been left unchanged (except for the marking of a cycle lane). The openness of the exit reduces the likelihood that a cyclist will get cut-up, and should make it clear whether the cyclist is exiting or continuing round. This arrangement also provides a good-sized triangle for use as a crossing island. This does risk excessive exit speed, making it doubly important that entry and circulation speed is kept low.